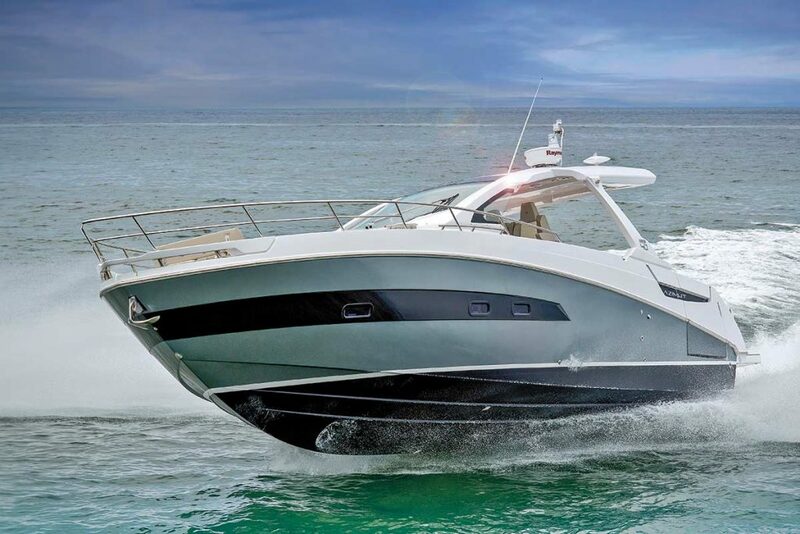 Part center console, part overnight cruiser, part walkaround, the new Azimut Verve 40 blends a vibrant on-deck layout and a luxurious Italian interior that’s perfect for enjoying the alfresco lifestyle. I’ve seen thousands of boats at hundreds of boat shows, but once in a while, I spot a show-stopping new design with exterior lines and subtle details that simply demands further inspection. 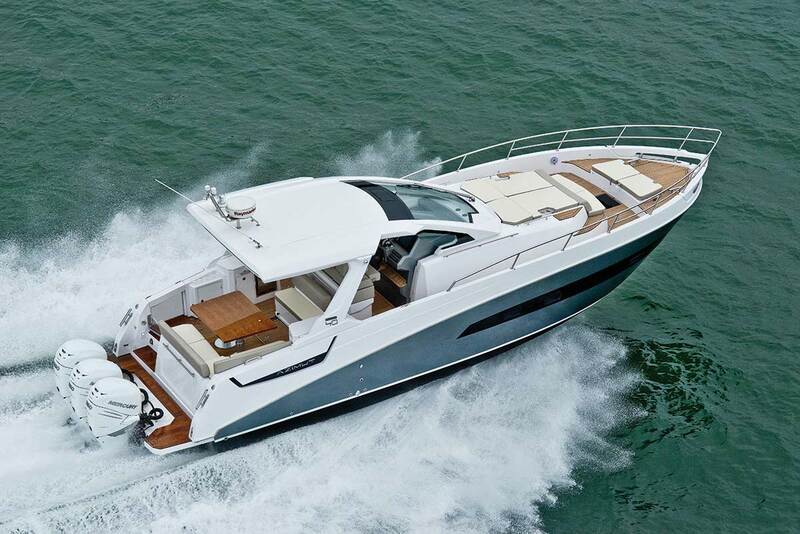 At the Fort Lauderdale International Boat Show last November, that boat was the Azimut Verve 40, a combination of walkaround, center console, and overnight cruiser, and I wasn’t the only one who succumbed to its magnetic appeal. Significant bulwarks enclose the foredeck, with a wide slot between the bulwark and deck forward that hides cleats and rollers for dock lines. Two contemporary mooring cleats are mounted on a raised section of deck as well as ground tackle and a windlass for the anchor (that projects through a port on the stern), which are hidden below the foredeck hatches. The bulwarks increase in height going aft and are flanked by large diameter, stainless steel handrails on both sides for approximately half the length of the boat. At that point, there’s one step down to the cockpit level where more well-placed grab rails await. This yacht is carefully thought out for safe fore-and-aft movement of crew or guests and equipped with beautifully laid narrow teak decking on all weather decks—even on the deck surfaces flanking the three outboard engines. 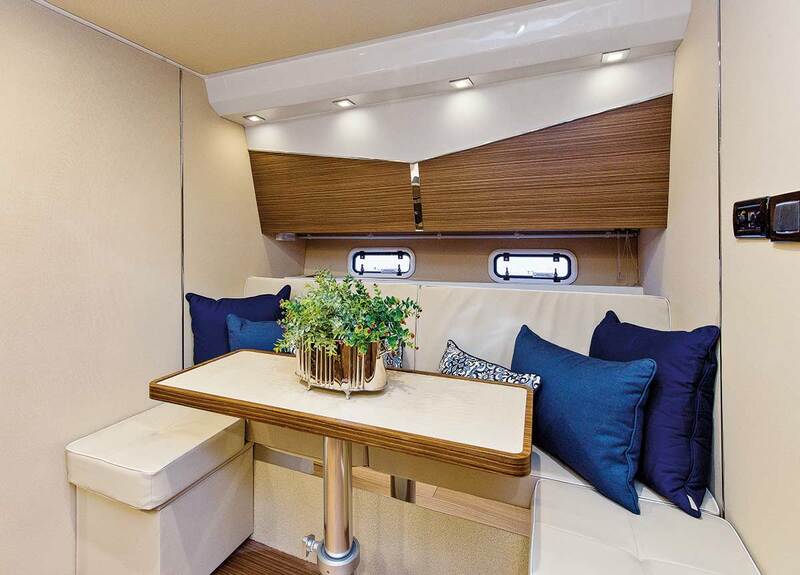 For sun worshippers, the foredeck offers a choice of either twin sunpads with adjustable lounge backs or a two-bench seating area for four with storage under both. The well-raked, sculpted deckhouse and full-height windshield flow into a hardtop that covers the helm amidships and most of the aft cockpit deck. Three large, ergonomic and incredibly comfortable leather-upholstered helm chairs with flip-up bolsters front the console, all electrically fore-and-aft adjustable. An angled foot-relief step is molded into the console below for the center and starboard seats, and the leather-clad sport steering wheel is operated from the center seat. For maneuvering, the bow thruster control is located to the left of the wheel, while the twin-lever Digital Throttle & Shift (DTS) binnacle and Axius Joystick, which can be equipped with Mercury’s trademark Skyhook position holding system, are located to the right. Directly above the binnacle, the Mercury VesselView display is flanked by two large Raymarine Multi-Function Displays (MFD). 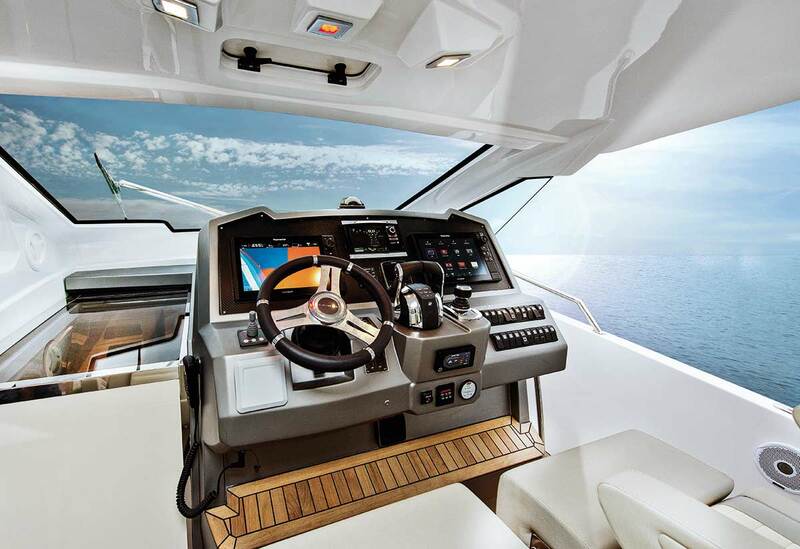 It’s a nice setup since one screen is directly ahead of the steering wheel; the helmsman can quickly glance down and get a visual update while maintaining a proper view of the waters ahead. Visibility is outstanding from the helm seat, partly because it sits on a slightly raised section of cockpit deck but also due to the large molded locker on which the three seats are mounted. 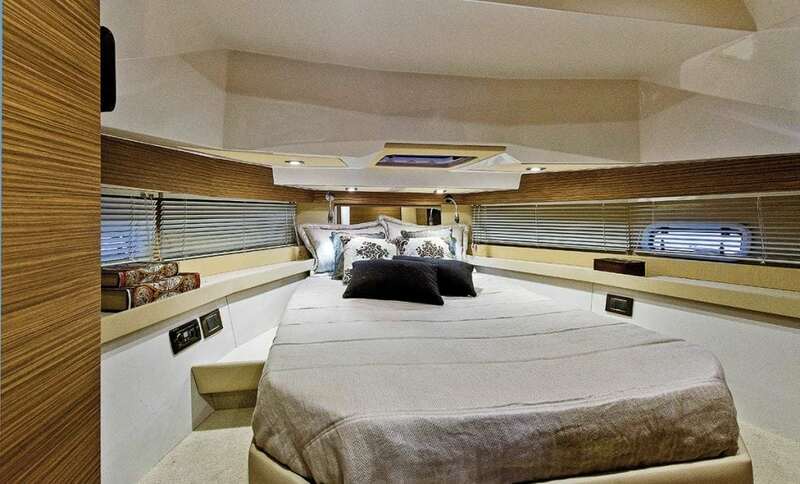 Azimut’s designers included an overhead hatch for added ventilation at the helm, and they placed all LED lights in the molded hardtop for proper nighttime illumination with a dedicated light for night running. The cockpit is equipped with an aft-facing bench seat, a large L-shaped bench seat and a beautifully finished table. Just ahead of the aft-facing seat, a hatch opens for access to an optional Seakeeper stabilizing system and generator. Interestingly, this seat is mounted on Harken slider rails, and it can be repositioned to form a C-shaped dinette around the table. With a flip of a switch, the table lowers to form a second sunpad that’s well protected from the wind when at anchor. And to help minimize sun exposure to the entire cockpit, an electrically operated SureShade ATF canvas Bimini extends from inside the hardtop for additional comfort. Two small molded lockers with fold-down tops, one to each side of the seating area, contain a wet bar with an icemaker and optional wine cooler (to port), while an outdoor grill is to starboard with a refrigerator. Both consoles are positioned and sized to help keep traffic flowing freely along both sides. Additional storage in the cockpit is found beneath the L-shaped settee, inside the aft-facing bench and under the seat-bearing locker. There is also an insole drained locker along the port side for storing wet lines and fenders. A clever, unexpected feature is the fold-down section of the portside cockpit gunwale and hull section that forms a boarding or swimming platform. It is also fitted with a bracket for a T-shaped sport and diving ladder. 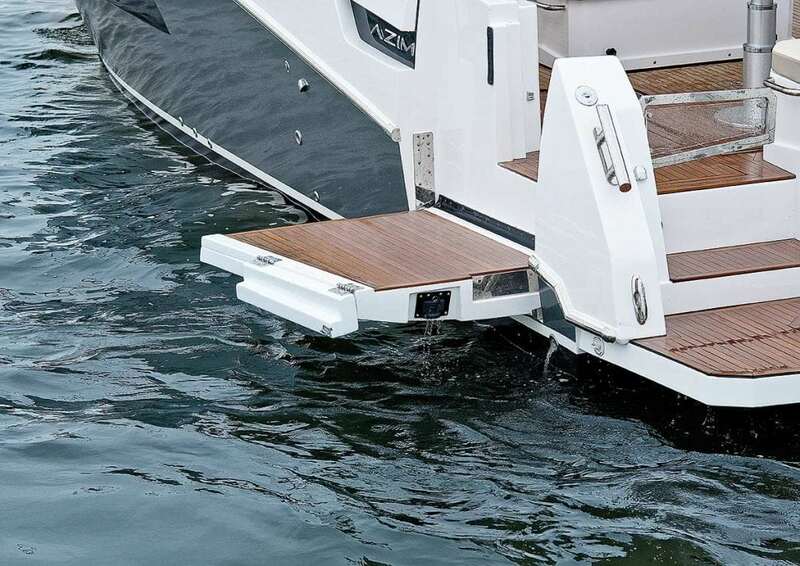 A two-position platform door opens to allow access to the swim platforms and cross-transom connecting deck of the outboard engine mounting bracket. A handy stainless steel grab rail across the transom adds safety when the time comes to inspect what’s under the hood of the triple 350-hp Mercury Verado four-cycle outboards. Each Verado is equipped with a cold air intake system that delivers fresh air to a water-cooled supercharger for increased efficiency and power. A specially designed oil cooler helps extend engine-operating life. The valve train is designed to be maintenance free for the life of the outboard. And its heavy-duty gear case features stronger components to handle the stresses of high-speed offshore running. Just to port of the helm station, three steps descend into the salon. Custom wood in a matte finish, soft leather upholstery and polished stainless work together to solidify the clean, contemporary lines of the interior. The electrical switch panel is set to port next to the stairs behind a smoked glass door. The compact galley is furnished with a solid surface countertop with a single under-counter brushed stainless steel sink next to an electrical cooktop. A microwave is inset under the cooktop, and there is storage both above and below that’s sufficient in volume to accommodate all the necessities for weekend meals. The C-shaped dinette to starboard has a manually adjustable table that can be lowered to make a snug berth sized for two young children. Natural air and ventilation are provided by two opening portlights on either side of the salon. A sliding door aft provides access to a large wet head of sufficient size to accommodate adults comfortably. Another sliding door forward opens to reveal the single stateroom that’s notable for its beautiful woodwork, two hanging lockers and an island double berth with steps to make getting in and out of bed easier. Privacy blinds run the length of the cabin for a comfortable, private getaway. The new Azimut Verve 40 is a beautifully finished, well-executed design from Italy’s largest boat builder. The overall styling is distinctly Italian, yet restrained. But the materials and craftsmanship are first rate, very much in keeping with a builder of fine yachts that range from 10 to 100 meters in length. If you’re in the market for an outboard-powered sport walkaround, don’t miss seeing this one.